Recuva is a popular data recovery software for Windows users. If you are a Mac user, it will be very difficult for you to get the Recuva Mac. This is because there is no Mac version of Recuva and any tool you find with that name has to be a fake. It is recommended that you find a reliable Recuva alternative instead. iMyFone AnyRecover for Mac has been trusted for customers from all over the world. It is an all-in-one solution for Mac data recovery. Its built-in file previewer allow you to view the files before recovering. Apart from this, when compared with other Mac data recovery tools, AnyRecover has the highest recovery rate. It has been proved the most popular alternative of Recuva Mac version. Restore lost files from your Mac quickly and conveniently. Over 1000 file formats are supported, including videos, photos, music, documents, archives, etc. Preview files before recovery. This is a useful feature as it makes selective data recovery highly convenient. Allow you to recover deleted/lost data from any storage medium, such as hard disk, SD cards, flash drives, camcorders, digital cameras, etc. Cover a wide range of scenarios, such as system crash, hard drive failure, damaged hard drive, virus/malware attack, etc. Step 1. Make sure AnyRecover installed on your computer. From the home interface, select Deleted Files Recovery. Step 2. Choose or specify a location for scan. Once seleted, go to the next step by clicking on Next. Step 3. It will begin the scan process, once it is completed, select all your deleted files and choose a location to store them. Time Machine is a built-in backup app of macOS that allows you to restore your Mac to a previous timeline and recover your deleted files. A lot of Mac users use Time Machine as an alternative of Recuva Mac because it's easy to use and provides excellent results. Time Machine is a reliable tool and also works with Apple Time Capsule. Time Machine works perfectly even after a system crash. You can use Time Machine to go back in time and see what a certain file looked like on a certain date in the past. You cannot use this tool to recover deleted data from an external storage device. VirtualLab is another great Recuva Mac alternative. It is a simple program that allows you to conveniently recover deleted files on your Mac. 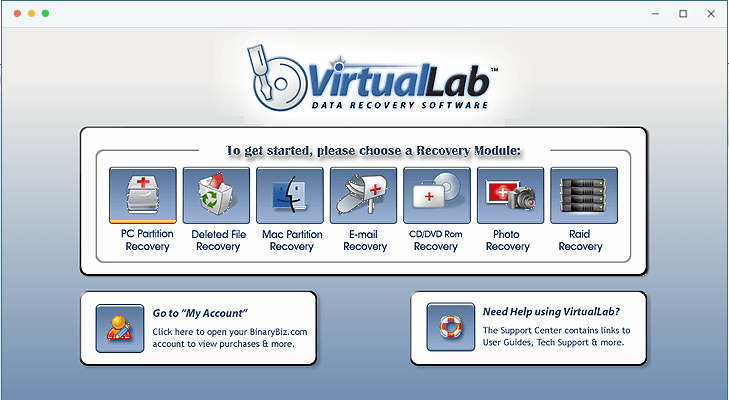 There are two recovery modes of VirtualLab i.e. iPod recovery and lost file recovery. It supports data recovery from RAID drive, unmounted volume, as well as USB drive and firewire. You can recover deleted data from any drive via this tool as long as it is not physically damaged. All kinds of files can be easily recovered via VirtualLab. Recover files deleted due to partition damage, damaged operating system, formatted drive, and more. VirtualLab offers a special RAID constructor so you can easily recover deleted data from RAID drives. You can also recover deleted data from unmounted volume via this tool. You cannot save your scanning result. You cannot search the recoverable files for selective recovery. Unfortunately, Recuva is not available for Mac. The good news is, there are several reliable alternate available for Recuva Mac. It is highly suggested that you install iMyFone AnyRecover as it can recover any lost files for your Mac and has the highest data recovery rate.